By their fruits you will know them, says Our Lord of those who claim to be His followers. The fruits which remain of the life, labors and prayer of Saint Teresa of Avila bear to her virtue a living and enduring testimony which none can refuse to admit. She herself wrote her life and many other celebrated spiritual works, and much more can still be said of this soul of predilection, whose writings and examples have led so many souls to high sanctity. Born in 1515 in the kingdom of Castile in Spain, she was the youngest child of a virtuous nobleman. When she was seven years old, Teresa fled from her home with one of her young brothers, in the hope of going to Africa and receiving the palm of martyrdom. Brought back and asked the reason for her flight, she replied: I want to see God, and I must die before I can see Him. She then began, with her same brother, Rodriguez, to build a hermitage in the garden, and was often heard repeating: Forever, forever! She lost her mother at the age of twelve years, and was led by worldly companions into various frivolities. Her father decided to place her in a boarding convent, and she obeyed without any inclination for this kind of life. Grace came to her assistance with the good guidance of the Sisters, and she decided to enter religion in the Carmelite monastery of the Incarnation at Avila. For a time frivolous conversations there, too, checked her progress toward perfection, but finally in her thirty-first year, she abandoned herself entirely to God. A vision showed her the very place in hell to which her apparently light faults would have led her, and she was told by Our Lord that all her conversation must be with heaven. Ever afterwards she lived in the deepest distrust of herself. When she was named Prioress against her will at the monastery of the Incarnation, she succeeded in conciliating even the most hostile hearts by placing a statue of Our Lady in the seat she would ordinarily have occupied, to preside over the Community. God enlightened her to understand that He desired the reform of her Order, and her heart was pierced with divine love. The Superior General gave her full permission to found as many houses as might become feasible. 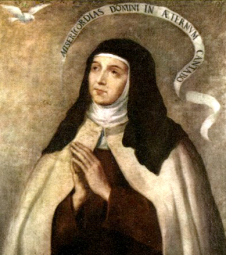 She dreaded nothing so much as delusion in the decisions she would make in difficult situations; we can well understand this, knowing she founded seventeen convents for the Sisters, and that fifteen others for the Fathers of the Reform were established during her lifetime, with the aid of Saint John of the Cross. To the end of her life she acted only under obedience to her confessors, and this practice both made her strong and preserved her from error. Journeying in those days was far from comfortable and even perilous, but nothing could stop the Saint from accomplishing the holy Will of God. When the cart was overturned one day and she had a broken leg, her sense of humor became very evident by her remark: Dear Lord, if this is how You treat Your friends, it is no wonder You have so few! She died October 4, 1582, and was canonized in 1622. The history of her mortal remains is as extraordinary as that of her life. After nine months in a wooden coffin, caved in from the excess weight above it, the body was perfectly conserved, though the clothing had rotted. A fine perfume it exuded spread throughout the entire monastery of the nuns, when they reclothed it. Parts of it were later removed as relics, including the heart showing the marks of the Transverberation, and her left arm. At the last exhumation in 1914, the body was found to remain in the same condition as when it was seen previously, still recognizable and very fragrant with the same intense perfume. Reflection: The devotion of Saint Teresa of Avila to Saint Joseph, virginal father of Jesus, is proverbial. She said she had never asked anything of him without receiving what she requested. In the eighteenth century the Carmelite churches named for him numbered over one hundred and fifty. Let us imitate this holy Foundress and invoke Saint Joseph for our needs, both spiritual and temporal. The whole Law is fulfilled in one word: Thou shalt love thy neighbor as thyself.